Remember our page of interactive maps showing the most dangerous cities for American workers? We’ve just added the latest data from 2015 with updated rankings and new observations. We also improved our method for mining the data to give you a more accurate view. So where does your city rank now? Businesses now have another incentive to bring their occupational safety training up to date. For the first time in 25 years, fines for workplace safety violations are due to increase following passage of a new bill signed by President Barack Obama. As a result of the legislation, analysts expect a possible 80 percent increase in OSHA fines, which are set to rise steeply to catch up with inflation rates. Despite the hefty OSHA penalty boost, other safety organizations, including the EPA, will also soon issue significantly larger fine increases. As such, businesses are encouraged to add environmental health and safety training to their list of priorities. Many industry experts and lawyers support the new penalty structure, believing it long overdue. The previous Federal Civil Penalties Inflation Adjustment Act of 1990 excluded OSHA from the list of agencies required to increase their fines in tandem with inflation. 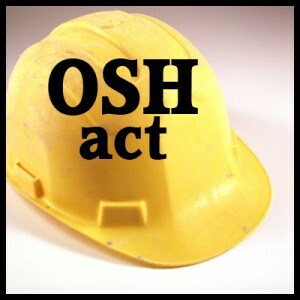 OSHA Chief Dr. David Michaels had long spearheaded a rise in fines for negligent safety practices. While some worry about the burden these fines could place on small businesses or startups, experts agree that the change is a positive one that pushes the industry toward a higher standard of occupational health and safety training. Countless cases of safety oversights and intentional worker endangerment have resulted in worker injury or death. OSHA has clearly outlined safety standards to protect workers from falls, electrical and chemical hazards, active machinery, and other workplace dangers. OSHA is reviewing the legislation and will determine the new fine structure by the time the new budget is in place on July 1, 2016. Estimates for increased fines include $12,600 for Serious violations up to $126,000 for Repeat violations. The new penalties will come into effect on August 1, 2016. Employees at all levels of an organization are encouraged to complete a comprehensive safety training course to protect themselves and co-workers from these dangers. Businesses should establish written safety protocols that outline how to identify, prevent, and report workplace safety hazards. Employers with existing safety protocols should review and revise them to ensure they meet the latest OSHA standards. OSHA Pros offers a broad range of online safety training courses as well as onsite training and consulting. Invest in occupational safety training today to protect your workers, avoid fines, and keep your business in good standing. Contact Us for more information or sign up for an OSHA safety course today. Reduction in occupational exposure to isocyanates implemented by OSHA. The U.S. Department of Labor’s Occupational Safety and Health Administration (OSHA) has implemented a National Emphasis Program to identify and reduce health hazards related to occupational exposure to isocyanates. 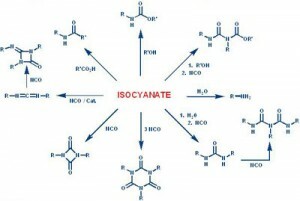 The program is designed to raise awareness of the serious health effects of isocyanate exposure. Exposure to these chemicals occur in many different occupations, including the manufacturing of polyurethane foam, insulation materials, furniture, car seats, carpet padding, polyurethane rubber and adhesives, shoes, packaging materials, and laminated fabrics. Workers can also be exposed to isocyanates while painting or blowing foam insulation. There are many serious health effects associated with occupational exposure to isocyanates. Adverse effects range from skin irritation, to irritation of mucous membranes, difficulty breathing and chest tightness, as well as asthma. These chemicals also are known to cause cancer in animals. Fifteen percent of adult onset asthma cases in the United States are caused by occupational exposure to these substances. The emphasis program will used a combination of enforcement and outreach to raise awareness to the hazards and how to reduce or prevent them. The program is designed to reach workers, their employers, safety professionals, and health professionals. The program will continue for three years. Outreach will be directed to general industry, the construction industry, and the maritime industry, as exposure to isocyanates occurs in all of these. OSHA will identify which facilities are most likely to have occurrences of overexposure to isocyanates and will target them for inspections. Inspections schedules will be random. Sites found to have violations will have follow-up inspections to determine if the hazards have been eliminated. Both OSHA and the National Institute of Safety and Health (NIOSH) have developed resources with information about isocyanates, the effects of exposure on health, and safety procedures and standards to reduce or eliminate overexposure to these compounds. OSHA’s Isocyanates Safety and Health Topics Page provides access to resources on this topic. Related informational resources available on the OSHA website include: Safety and Health Topics Pages on Occupational Asthma, Hazard Communication, Personal Protective Equipment, Respiratory Protection, Spray Operations, and Ventilation. NIOSH resources also include a Workplace Safety and Health Topics Page on Isocyanates, as well as Safety and Health Topics Page on Asthma and Allergies, and a print publication entitled Preventing Asthma & Death from MDI Exposure During Spray-on Truck Bed Liner and Related Applications. For a detailed explanation of the National Emphasis Program on Occupational Exposure to Isocyanates you can view the directive issued on the program at: https://www.osha.gov/OshDoc/Directive_pdf/CPL_03-00-017.pdf. Columbia Southern University, which offers an associate’s degree in applied science in Occupational Safety and Health, is now accepting the OSHA Hazwoper 40 training course as taught by OSHA-Pros for college credit towards their degree program. The course be substituted for Columbia Southern’s BOS 3125 Hazardous Material Management course, and students will receive 3 hours of college credit for it. The 40 hour Hazwoper training course covers the handling of hazardous chemicals and safety precautions needed to avoid the dangers of exposure to these chemicals. Workers who are involved in emergency response operations, clean-up operations, or are employed at hazardous waste sites will gain an understanding of the OSHA regulations under standard 29 CFR 1910.120 regarding the safe storage, treatment, and disposal of hazardous materials. OSHA-Pros offers the 40 hour Hazwoper course online, which allows the student flexibility in scheduling and the convenience of being able to take the course from home. Students who take the course as a work requirement must also complete additional training from their employers on the jobsite, plus complete 3 days of supervised field experience under a trained supervisor provided by their employer to meet OSHA standards. Upon completion of the course you will receive a Department of Labor Wallet Card. A temporary certificate can be printed until your Wallet Card arrives, which can take several weeks. The Wallet Card (or temporary certificate) can be provided to employers to verify successful completion of the Hazwoper 40 hour course. And if you choose to receive 3 hours of college credit towards the Associate of Applied Science in Occupational Safety and Health from Columbia Southern University the card will serve as proof of your completion of the course. Hydrogen sulfide is an extremely dangerous gas known for its smell which is similar to that of rotten eggs. It is sometimes referred to as sewer gas or swamp gas. The National Institute for Occupational Safety and Health describes hydrogen sulfide as an acute toxic substance that is the leading cause of sudden death in the workplace. Hydrogen sulfide occurs naturally as a product of the breakdown by bacteria of organic materials including sewage. It is also present in crude oil, natural gas, and in hot springs. Hydrogen sulfide gas can also be produced as a result of certain industrial processes such as wastewater treatment, and drilling and refining of petroleum and natural gas. Other industries that can produce the gas are paper mills, tanneries, and coke ovens. There is a liquid compressed form of the gas also. The greatest danger of hydrogen sulfide gas is through inhalation. The gas is absorbed rapidly through the lungs and at high levels can cause chemical asphyxiation, affecting the body’s ability to utilize oxygen and adversely affecting the central nervous system. Although the gas has a strong, unpleasant odor, being continuously exposed to low levels can cause a person to lose his or her ability to smell it because of what is known as olfactory fatigue. High concentrations of the gas can also have this effect, so that relying on one’s sense of smell is not a reliable way to detect it. Even at low levels of concentration the gas causes irritation of eyes, nose, throat, and throughout the respiratory system. At high concentrations it can cause convulsions, shock, inability to breath, coma, and death, in some cases almost immediately. Precautions must be taken where hydrogen sulfide is present. These should include testing and monitoring air quality for the presence of, and level of, the gas; providing adequate ventilation if the gas is present; and, if the gas cannot be removed, providing appropriate respiratory protective equipment for a person entering a space where the gas is present. OSHA’s confined space entry standard has specific requirements to follow for identifying and monitoring such toxic gases in confined work spaces. It also is necessary to monitor anyone who works in areas that contain hydrogen sulfide for signs of overexposure. Recently the former president of Port Arthur Chemical and Environmental Services, LLC (PACES) entered a guilty plea in federal court for violating the Occupational Safety and Health Act (OSH Act) in allowing employees of his company to be exposed to hydrogen sulfide without protection, resulting in the death of an employee. Not only did he not provide protection from exposure to employees, but he was charged with falsifying transportation documents to conceal the presence of wastewater containing hydrogen sulfide that his company was shipping. These actions led to the death of truck driver Joey Sutter in December of 2008 from exposure to the gas while transporting the wastewater. The company president, Martin Lawrence Bowman, could receive up to five years in prison and up to $250,000 in fines when sentenced. His corporation is facing a fine of up to $500,000 for each violation. Numerous governmental agencies were involved in the investigation of the case, including the EPA, the U.S. Department of Transportation, the Texas Environmental Enforcement Task Force, Texas Parks and Wildlife, Houston and Port Arthur Police Departments, OSHA, the District Attorney’s Offices of Travis and Harris counties, the Houston and Port Arthur Fire Departments, and the U.S. Coast Guard. Not only did this employer fail to create and follow a plan to protect employees from the known exposure to this dangerous substance, but he purposely avoided doing so, choosing profits over the safety and lives of his employees. Employers have a responsibility to ensure the safety and health of their employees. Workers have the right to a safe and healthy workplace. Tornado season is once again upon us. Businesses should prepare for the possibilities of tornadoes by creating an emergency plan to try to keep employees as safe as possible. A good emergency plan should include such details as where to take shelter and accounting for all personnel. Consideration should also be given to any hazardous materials that are on the premises. Basements or storm cellars, or other underground areas provide the best shelter from a tornado. If no such underground shelter is available, then an interior room or hallway on the first floor of a building, away from doors, windows, or outside walls is best. Avoid auditoriums, gymnasiums, or cafeterias, with wide, flat roofs. If caught outdoors, personnel should see out a sturdy building or basement. If no building is within walking distance, one can try to drive to a nearby shelter. To protect oneself from flying debris if driving, either stay in the vehicle with seat belt on, covering your head with your hands or a blanket. If a low area such as a ditch is near, lie in that area, covering your head with your hands. 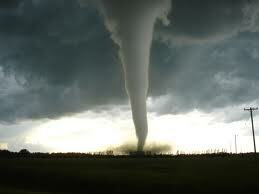 Within the workplace, procedures should be developed to prepare for the possibility of tornadoes. An emergency plan should include a system for knowing and accounting for who is in the building at the time of an emergency. A plan should be created to communicate emergency warnings to employees with limited English speaking skills, and also employees with disabilities. As employees and visitors or customers enter the shelter area, take a head count or use a checklist to account for everyone. The plan should include assigning responsibilities to workers during an emergency, with alternate employees for backup as well. Workers should be trained and the plan practiced so that everyone will know what to do in case of an actual emergency. An emergency supply kit should be kept on hand. Some basic items to include are a NOAA Weather Radio, and other battery powered radio, a flashlight with extra batteries, a first aid kit, dust masks, plastic sheeting and duct tape, and a three day supply of food and water. A more complete list of items to include in an emergency disaster kit can be found at http://www.fema.gov/media-library-data/1390846764394-dc08e309debe561d866b05ac84daf1ee/checklist_2014.pdf. 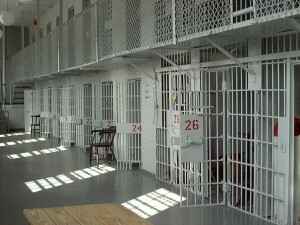 Walter Cardin, 55, of Metairie, Tennessee, was sentenced on April 12 in U.S. District Court for lying about worker injuries while working as safety manager for the Shaw Group. Cardin was sentenced to six and half years in prison followed by two years of supervised release. In November Cardin was convicted of eight counts of major fraud against the United States. The charges involved not reporting or misclassifying worker injuries at three plants owned by his employer, Stone and Webster Construction, a subsidiary of the Shaw Group. The falsified injury records enabled his company to collect $2.5 million in safety bonuses from the Tennessee Valley Authority, the U.S. government agency which oversees nuclear facilities. Cardin could have received a sentence of up to 10 years in prison and fined up to $1,000,000 for each offense. Cardin’s employer, Stone and Webster Construction had been contracted by the TVA to provide repair and maintenance services at three nuclear sites as well as construction work for a restart at one of the facilities. Cardin falsified safety records at the Sequoyah and Watts Bar plants in Tennessee and Brown’s Ferry in Alabama between 2004 and 2006. The TVA-Office of Inspector General conducted an investigation that led to the charges being filed. Evidence was presented in the case of more than 80 injuries not properly recorded. Employees testified that medical treatment for their injuries was delayed or denied due to the falsified reports. In early 2009, Stone and Webster Construction, Inc. paid $6.2 million to the federal government in a civil settlement for the alleged improper recording of safety records while under a $10-billion long-term contract with the TVA. In addition to the charges of falsifying records, Cardin was found to have obstructed justice after denying that he intentionally misclassified the records and saying that he had no knowledge of safety bonuses being tied to the injury reports, after investigators found emails that proved otherwise. This charge was taken into account in deciding Cardin’s sentence. Prosecutors comments on the case pointed out that Cardin’s actions in his role as safety manager affected safety at nuclear sites, discouraged employees from reporting injuries, resulted in employees having to work with injuries that could create further risks to themselves and others, and kept employers from addressing other safety issues. Every year on April 28, the anniversary of the date in 1971 when the OSH act went into effect and OSHA was officially established, the U.S. Department of Labor and other occupational safety and health organizations in the U.S observe Workers’ Memorial Day. The day honors workers who have died from occupational injuries or illnesses during the previous year. In 1985 Workers’ Memorial Day became an official holiday in Canada. It has been recognized in the U.S. since 1989, and since that date spread worldwide. The day is now known as International Workers’ Memorial Day. In Washington, D.C. a ceremony was held on April 29 attended by the acting U.S. Secretary of Labor Set Harris, Assistant Secretary Dr. David Michaels, who heads the Occupational Safety and Health Administration (OSHA), and Assistant Secretary Joe Main, director of the Mining Safety and Health Administration (MSHA). Also in attendance were family members of workers who died during the past year. A panel discussion was also held on occupational safety and health protections for temporary workers. Also remembered were those who died in the recent collapse of a building that housed a garment factory in Bangladesh. At least 348 workers died in that disaster and five people have been arrested for their responsibilities in the tragic occurrence. Dr. Howard talked about current initiatives that NIOSH is focusing on. “Falls are a basic cause of serious injury and death at work, and they continue to impose human and economic costs on the construction industry. Financial experts agree that a robust construction industry is a key ingredient for sustained economic recovery and growth. A robust industry must be free of injuries that impair and kill workers. On April 28, the National Institute for Occupational Safety and Health (NIOSH) and its diverse partners will re-launch their national information and media campaign to prevent falls, fall-related injuries, and fall-related deaths in construction. What Safety Measures Might Have Prevented the Explosion in West, Texas? A number of facts have come to light regarding the recent fire and explosion at the West Chemical & Fertilizer Co. plant. 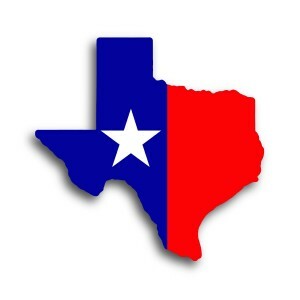 Although there are plenty of federal and local standards and laws in place to insure occupational and environmental safety, something didn’t work to prevent the tragedy that occurred in West, Texas this past week. Facilities which store and use hazardous chemicals are required to follow certain safety standards and procedures. West Chemical & Fertilizer Co. had reported to the Environmental Protection Agency that the worst possible hazard from the 54,000 pounds of anhydrous ammonia stored and used at the plant would be a 10-minute release of ammonia gas which would not injure or kill anyone. Another possible problem, they said, could be a leak from a hose used to transfer the material, but this also was considered as not presenting a risk of injury. However, in 2006 a complaint was filed with the Texas Commission on Environmental Quality stating that there was a “very bad” smell of ammonia at the plant. The agency investigated and cited the company for failing to obtain or to qualify for a permit. A review of the records also found that the most recent inspection by the Occupational Safety and Health Administration (OSHA) of the plant was 1985. At that time, OSHA issued a $30 fine for a serious violation for storage of anhydrous ammonia. Although the plant was cited for 4 other serious violations of respiratory protection standards, they negotiated a settlement under which they only paid the one fine of $30, although the maximum fine for a serious violation at the time was $1,000. Due to OSHA’s lack of adequate numbers of inspectors, many workplaces can go without inspections for years. Another consideration which has been discussed was the wisdom of the zoning that allowed schools, nursing homes, and houses to be built in such close proximity to a fertilizer plant that housed a 12,000 gallon tank of volatile substances. It has been suggested that part of the safety planning should have included zoning considering that the type of explosion resulting from these chemicals not only destroyed the facility but seriously damaged the surrounding, injuring and killing people in the area. It is clear that these possible contributing factors in the tragedy are the results of many different causes including lack of funding for agencies such as OSHA, so that there are an inadequate number of inspectors to conduct regular and timely safety inspections of workplaces such as this one. Another consideration which has not been mentioned in the press, but is readily available is that of safety training, such as the OSHA Authorized Outreach Training available for workers and supervisors. If employees are well-trained in safety standards and in identifying safety hazards in the workplace, then they can report safety hazards that are not being rectified by employers to OSHA or other appropriate governing agencies at all levels to alert them of the need for enforcement. This type of feedback could prove invaluable in saving lives by making sure that safety standards are followed or enforced. If everyone participates in and takes responsibility for safety then perhaps tragedies like the one at the West Fertilizer plant could be averted in the future. Having an effective safety and health management system (SHMS) can help reduce work-related illnesses and injuries and save injury-related costs for businesses. It is estimated that injuries and illnesses cost U.S. businesses approximately $170 billion a year. An SHMS will help a business go beyond just complying with laws to anticipating and preventing any possible risks in the workplace. Steps to encourage management commitment and employee involvement include creating a clearly stated policy on safe and healthy working conditions; a clear goal and objectives for meeting that goal; top management involved in implementing the system; employee involvement in decisions that affect they health and safety; assigning responsibilities to everyone in the organization for the management system, including managers, supervisors and employees; and annual reviews of the system to evaluate is effectiveness and deficiencies. To complete a worksite analysis it is necessary to identify all hazards by conducting initial worksite surveys as well as periodic follow-up surveys; analyze the hazards of particular jobs or processes; inspect the site regularly; a system for employees to notify management of hazardous conditions without reprisal; determine causes of any accidents or incidents to enable prevention strategies; and analysis of patterns and problems over an extended period of time. For hazard prevention and control OSHA recommends using engineering controls; administrative controls such as adjusting work schedules to minimize exposure to hazards; work practice controls; and personal protective equipment. Also recommended is preparing for emergencies by conducting drills and providing training; and creating a medical program that includes first aid and emergency medical care. 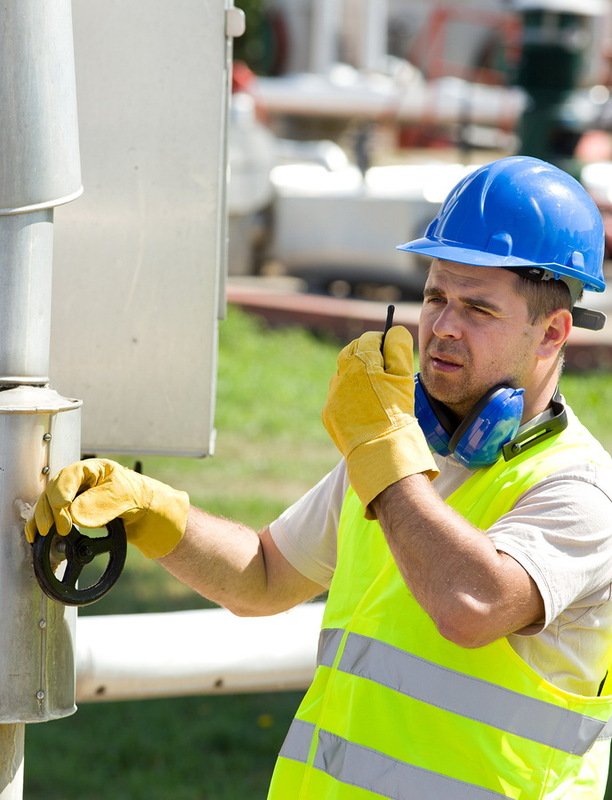 Safety and health training should ensure that all employees, including contract workers, understand the hazards they may encounter on the job and how to deal with them safely; ensure that supervisors understand what their responsibilities are and why they are important to effective safety practices; and provide periodic refresher training to employees. Also available to assist businesses in creating a SHMS are Compliance Assistance Specialists and OSHA On-site Consultations. Dust explosions caused by combustible particles in a workplace are a serious hazard that can cause not only destruction of buildings and property, but also injuries and deaths of employees. Awareness of the conditions that can lead to these explosions can help to prevent them. 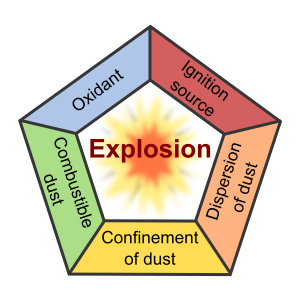 While fire requires the three elements of oxygen, heat, and fuel known as the “fire triangle”, there are five factors, known as the “dust explosion pentagon,” that can cause a dust explosion. Without all five, an explosion cannot occur. The five factors are oxygen, heat, fuel, dispersion, and confinement. These can cause an initial explosion or secondary explosions when dust is dispersed through the air near a primary explosion. Often secondary explosions cause more damage than the initial explosion resulting in serious damage and deaths. There are a number of industries where combustible dust exists. These include: chemicals, pharmaceuticals, pesticides, fertilizer, tire and rubber manufacturing, plastics, recycling operations, fossil fuel (coal) power generation, agriculture, food manufacturing (feed, flour, starch, spice, sugar, and candy) grain, tobacco, wood, paper, pulp, forest, rubber, furniture, textiles, dyes, coal, and metal processing (aluminum, iron, magnesium, chromium, and zinc). For information on combustible dust hazards visit the OSHA website at http://www.osha.gov . OSHA has partnered with the National Institute for Occupational Safety and Health (NIOSH) and the National Occupational Research Agenda (NORA) – Construction Sector to create a nationwide outreach campaign to raise awareness among employers and workers about fall hazards in construction and how they can be prevented. In 2010, of the 774 total fatalities in the construction industry, 264 fatalities from caused by falls. By planning ahead for work from heights, decisions can be made on what tasks will be involved in completing the work, the safest way to do the job, and what safety equipment may be needed for each task. Safety equipment and tools can be included in the estimate of the cost of a job. To provide safety for workers doing a job at six feet or more above lower levels, the correct equipment and fall protection must be provided, including the right kinds of ladders, scaffolds, and safety gear. For roof work, personal fall arrest systems (PFAS) which may included harness that worker ties to an anchor may be required. The PFAS must fit the worker and the equipment must be inspected regularly to ensure it is in good condition and safe for use. Workers must be trained in proper set-up and use of safety equipment they must use to complete a particular job. Employers must also train workers to recognize fall hazards involved in the work to be done. As part of the Fall Prevention Campaign, many resources have been provided by OSHA and it’s partners. Print materials such as posters, fact sheets, booklets, and e-tools are available. A number of training videos are available that cover specific tasks which include fall risks. Links are provided on the OSHA website to publications and other educational materials from many sources which cover risks and prevention of falls in construction work. In addition to English language materials, there are training materials available in Spanish, as well as some in Cambodian, Laotian, and Vietnamese. Specific topics covered in training workers about fall prevention include ladder safety, scaffold safety, and roof safety. 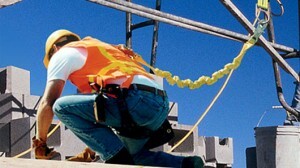 Videos provided cover particular types of work where falls hazards are common in construction including: floor openings, fixed scaffolds, bridge decking, reproofing, and leading edge work, and a more general video on fall prevention produced by California Fatality Assessment and Control Evaluation (FACE). To learn more about OSHA’s Fall Prevention Campaign and to access training and educational resources visit http://www.osha.gov/stopfalls/index.html.